Pollination is the process of mechanical transport of pollen from the anther to the pistil (stigma) of the plants. 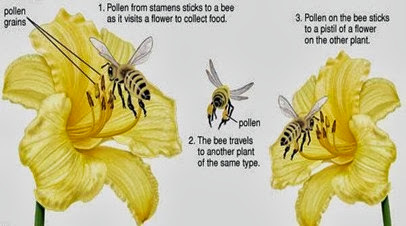 Pollination takes place in different ways (via insects, wind, etc.) and provides the opportunity to perform water-independent fertilization. Pollination has given a significant evolutionary advantage to flower plants. There are two main types of pollination: self and cross pollination. In self pollination, the pollen is transported from the anthers to the pistil (stigma) of the same flower (typical self pollination) or to another flower of the same individual (adjacent self pollination). This type of pollination is observed in about ¼ of the plants. It occurs, for example, in barley, peas, vetch, and peanut. Free self pollination – observed in plants with open blooming flowers, where cross-pollination is also possible. Forced self pollination – observed in plants with closed flowers, where cross-pollination is not possible, as well as in plants with open flowers. In plants with open flowers (for example some gramineous and legumes), the pollination takes place before the flower opens. For barley, for example, it is done before the flower has emerged from the leaf sheath, and in the case of peas and beans – before the flower buds have opened. In plants with closed flowers (for example peanut, violet) the pollen grows in the anthers and the pollen tubes directly reach the stigma. Adjacent self-pollination also occurs in monoecious plants. It occurs within a plant. 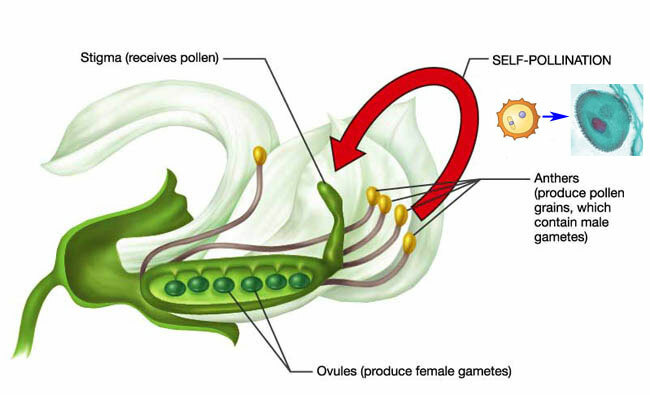 The female flowers of a certain plant are pollinated by the pollen of the male flowers of the same individual. In the case of cross pollination, the pollen from the anthers of a certain plant is transported to the pistil (stigma) of another plant. It occurs in the most of the flowering plants (in about ¾ of the species). The cross pollination provides greater genetic diversity and hence more vital offspring, compared to the self pollination. Dioecious plants – development of incomplete flowers (female or male) and dioecious plants. Hercogamy – spatial isolation between the anther and the pistil (stigma) of the same flower (Lamiaceae, Scrophulariaceae), so pollination is only possible with the help of insects, birds, wind, etc. Genetic incompatibility – widespread in plants where the pollen and ovules mature simultaneously (for example petunia, broccoli). The pollen and the stigma are recognized to be genetically related, as a result of which either the growth of the pollen or the growth of the pollen tube is blocked. Flowers with long pistils and short stamens have smaller pollen grains and longer papillae of the stigma. Flowers with short pistils and long stamens have larger pollen grains and shorter papillae on the stigma. The pollen of flowers with long stamens can be retained only on a stigma of a long pistil and vice versa, which makes self pollination impossible. Self Pollination: Self pollination is the process of transport of pollen from the anthers to the stigma of the same flower (typical self-pollination) or to the pistil (stigma) of another flower of the same individual (adjacent self pollination). Cross Pollination: In the case of cross pollination, the pollen from the anthers of a certain plant is transported to the pistil (stigma) of another plant. Self Pollination: Self pollination occurs in about ¼ of the flowering plant species. Cross Pollination: Cross pollination occurs in about ¾ of the flowering plant species. Self Pollination: Self pollination can occur without pollinating agent. Cross Pollination: Cross pollination needs pollinating agent – wind, insects, etc. The flowers pollinated by insects attract pollinators by color, production of nectar, odor, etc. The flowers pollinated by wind produce large quantities of small pollen grains. Self Pollination: Self pollination increases genetic uniformity and decreases genetic variation. Cross Pollination: Cross pollination increases genetic variation and decreases genetic uniformity. Self Pollination Self pollination reduces the gene pool. Cross Pollination: Cross pollination maintains the gene pool. Self Pollination: Self pollinating plant species produce limited amount of pollen. Cross Pollination: Cross pollinating plant species produce large amount of pollen. Pollination is the process of transport of pollen from the anther to the pistil (stigma). There are two main types of pollination: self and cross pollination. In self-pollination, the pollen is transported from the anthers to the pistil (stigma) of the same flower (typical self-pollination) or to another flower of the same individual (adjacent self pollination). In cross pollination, the pollen from the anthers of a certain plant is transported to the pistil (stigma) of a flower from another plant. Self-pollination occurs in ¼ of the flowering plants, cross pollination – in about ¾.
Self pollination can occur without pollinating agent, while cross pollination needs pollinating agent – wind, insects, etc. Self pollination increases genetic uniformity and decreases genetic variation, while cross pollination increases genetic variation and decreases genetic uniformity. Self pollination reduces the gene pool, while cross pollination maintains the gene pool. Self pollinating plant species produce limited amount of pollen, while cross pollinating plant species produce large amount of pollen. Dr. Mariam Bozhilova Forest Research Institute, BAS. "Difference Between Self and Cross Pollination." DifferenceBetween.net. 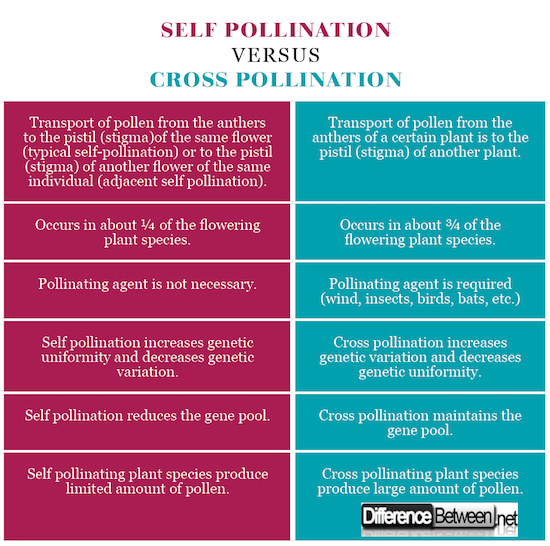 February 26, 2018 < http://www.differencebetween.net/science/difference-between-self-and-cross-pollination/ >. Barthelemy, Daniel and Caraglio, Yves. Plant architecture: a dynamic, multilevel and comprehensive approach to plant form, structure and ontogeny. London: Annals of Botany. 2007: 375–407. Print. Georgiev, G and E. Chakalova. Anatomy and Morphology of Plants. Sofia: Sveti Kliment Ohridski. 2000. Print. Neuhaus, Gunther. Morphology and Anatomy of Vascular Plants. Berlin: Springer. 2013. Print.